Quechua are a popular brand for air tents in the UK and have great range of tents that come in different sizes and sleep from 2-3 people up to 8. We have rounded up 5 of our favourite air tents from Quechua that are ideal for all depending on what you need. 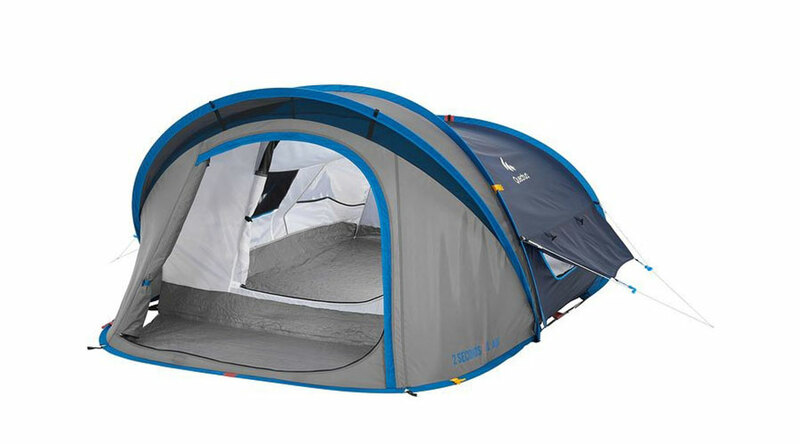 A perfect two man tent that is set up in seconds using a pump. The overall length of the tent is 282cm allowing space for the taller person to sleep, or space for bags and belongings. 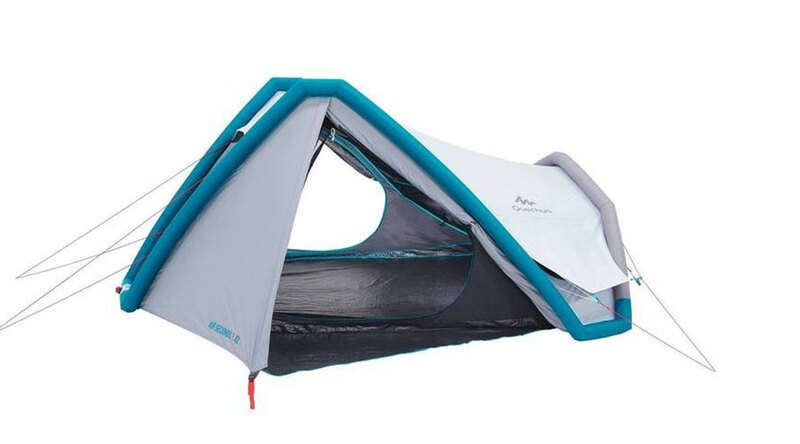 This tent would be ideal for hiking trips where you need a small tent to erect quickly and easily each night, or for festivals where space is a premium and something that is simple and easy to set up. It comes in a striking blue and ideal for one off camping trips. 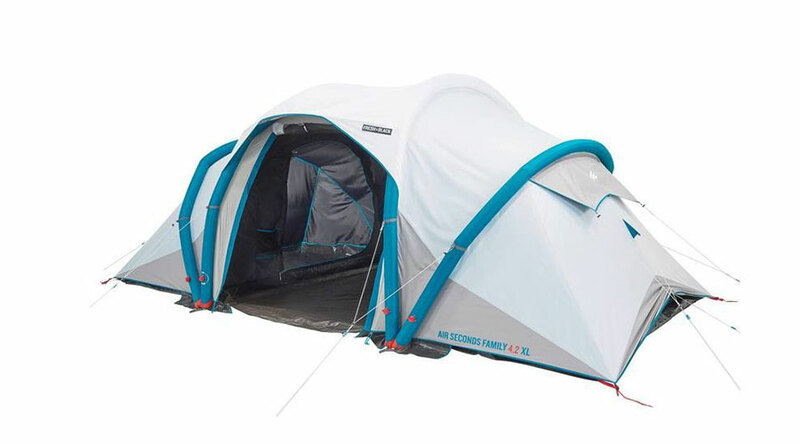 A great tent this is ideal for festivals, sleep overs or small camping trips. Sleeping up to 3 adults this is a cool and stylish looking air tent. The tallest point of the tent is just 128 cm high, so not suitable for standing in, but it 210cm wide in the centre for 3 people to sleep. the overall tent width is 360cm. it is important to note that no pump is included which is needed as this is an inflatable tent. 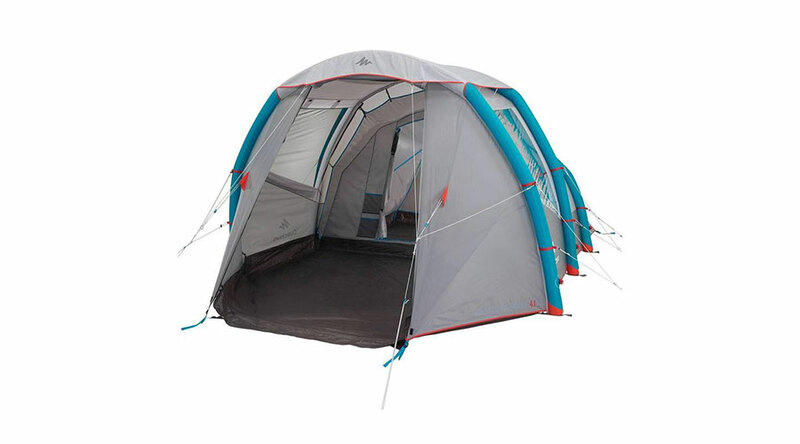 For families then this 4 person tent is ideal, with 4m2 of floorspace this is a good size tent, the tallest point is 155cm hight and 135cm in the inside sleeping area. The lined roof above the living area allows for ventilation and also limits condensation. When it comes to transporting this the tent weight when compacted down is 8.74 kg is 60 X 26 x 41 cm in size. The sleeping area has 2 small windows on either side of sleeping area. If you want a larger family tent that you can stand up in the this is ideal. At 190cm high in the living area it allows you to stand up there, the sleeping area is slightly lower and sleeps 4 adults easily. With a tall living room that measures 6.5 m² in size the bedroom is 210 x 280 cm. The cry weight is 12.3 kg and measures 75 X 30 x 32 cm. This tent although larger is still quick and easy to set up with the all-in-one inflatable structure installation using a air pump. In the living area you will find anti-mosquito windows and handy pockets on the outside of the bedroom. QUECHUA AIR SECONDS FAMILY 4.2 XL F&B – Spacious! If you want space then this is the one, this air tent has a 5.8 sqm living room with two bedrooms that sleep 2 people each measuring 260x140cm in size. This tent comes with the FRESH & BLACK fabric with patented outer giving 99% darkness even in broad daylight. The weight if this tent is 16.26 kg and has a cover of 75 X 39 x 39 cm. 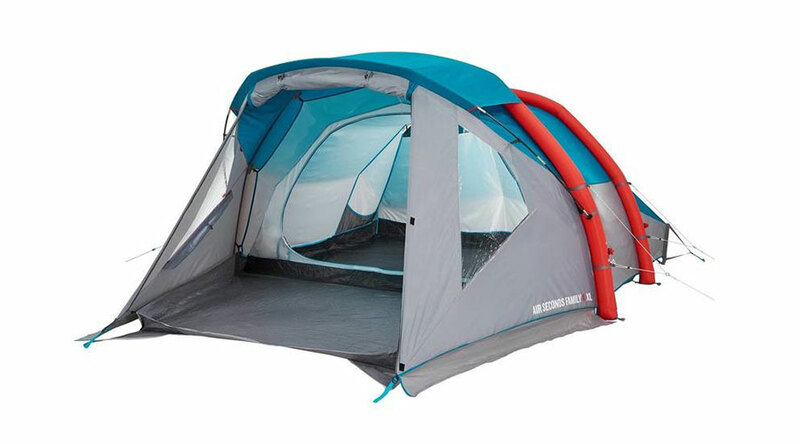 With space on the ground there is also a 1.95m headroom allowing you to stand up in the tent. It is important to note that these are air tents and require inflating to erect, although this is a simple task you do need a pump which these tents do not include. We recommend checking out the QUECHUA 5.2 L HAND PUMP that would be ideal for these tents.